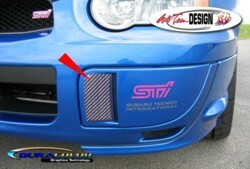 Detail your '04-'05 Subaru Impreza STi's Fog Light/Vent Covers with these unique Simulated Carbon Fiber enhancement decals. The two (2) piece kit comes complete with one decal for each side of the vehicle. They are very easy to install and they look Great!